Our RT Series control panels trigger SHEV systems and reset them if smoke and heat exhaust ventilation is required in an emergency. Display elements for operational standby, alarms and faults are the critical help mechanisms. The RT-BE operation unit allows for additions to the operation panel. This includes ventilation buttons, SHEV buttons, small acoustic or optical signal emitters or integrated fire or smoke compartments. 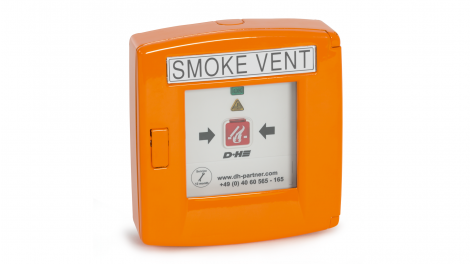 Whether double buttons, integrated indicator lights or key vent buttons with an additional indicator LED, the ventilation buttons from D+H perfect the reliable, manual operation of the ventilation controller. The buttons are available for both flush-mounted as well as surface-mounted installation. Wireless remote controls from the RC Series provide even more independence and allow flexibility in opening and closing your windows. Triggering the alarm is the first, critical step in case of fire. Our smoke detectors respond to smoke with either audible or visible signals. On the latest acoustic signal emitter, the CWSO-RR-S1, you can choose between 32 signal tones that are all approved in accordance with EN 54-3. Thermal detectors trigger an alarm at a specific temperature. 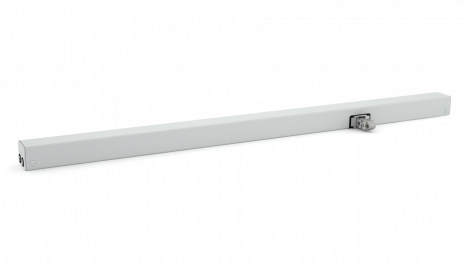 The UT 4U fire door operation panel lets you operate fire door control panels from the BAZ Series thanks to a trigger button, preventing the spread of smoke or fire in a building. The RT 45 SHEV operation panel is used to trigger and reset SHEV systems. Additional display elements for operational standby, alarms and faults are available. The RT BE45-1 operation unit is the standard version for the RT 45 SHEV operation panel. The RT BE45-1-LT operation unit for the RT 45 SHEV operation panel features additional ventilation buttons. The RT BE45-2 operation unit integrates two separate fire and smoke compartments in one RT 45 operation panel. The RT BE45-3 has the same functions as the RT BE45-2, but is equipped with three separate fire and smoke compartments in one operation panel. In addition to the operating lights for alarm, fault and monitoring, the SHEV operation unit RT BE42-ST has an additional acoustic signal emitter. Safety first: Our RT BE42-Z expansion operation unit, unlike the RT BE42-Z-K operation unit, features an indicator lamp in addition to the alarm and operational standby display. The RT LT45 additional operation unit, in addition to the RT operation unit, is built into the RT GEH02-LT housing to enable an additional ventilation function. The LT 84-U ventilation button is designed for flush-mounted installation. It features a double button and is used to control ventilation groups. Our LT 84-U-SD ventilation button has the same functions as the LT 84-U, but also features an integrated signal lamp. Our stylish LT 84-U-W flush-mounted button perfects operation for ventilation functions. The LT 84-U-V is a flush-mounted double button for activating ventilation groups. It provides optimal operation of 230 V systems. The key vent button for attractive flush-mounted installation, the SLT 42U, is the ideal choice for manually opening and closing a ventilation group in combination with a profile semi-cylinder. Ideal for flush mounting: Our SLT 42U-SD has the same functions as the SLT 42U key vent button and features an additional signalling LED. The SLT 42A is the surface-mounted variant of the SLT 42U key vent button. In conjunction with a profile semi-cylinder, it opens and closes a ventilation group. The SLT 42A-SD has the same applications as the SLT 42U-SD, but is used for surface-mounted installation. The LT 84-A ventilation button is the surface-mounted variant of the LT 84-U. It has a double button and enables reliable activation of ventilation groups. The RCR 11-2 wireless remote control is ideal for ventilation applications for activating OPEN, STOP and CLOSE commands. The RCT 003-11-U wireless transmission module is ideal for use in flush-mounted sockets and forwards the information of the connected buttons and sensors in a way that is undetectable from outside the system. Suitable for flush-mounted installation: The RCM 024-11-U is a wireless receiver and can activate up to two groups based on 24 V.
Our RCM 230-11-U wireless receiver is used for direct activation of 230 V drives. The SD-O 371 optical smoke detector is equipped with an alarm indicator and function check. The FD-T 271 thermal differential detector knows how to draw attention in the event of a fire. Visual alarm signals that cannot be ignored make it a dependable helper in an emergency. The TH 4/70 thermal detector has a great feel for temperatures: The surface-mounted detector sends a signal once a specific temperature has been exceeded. Our THE 4/70 thermal detector determines trigger temperatures and is installed in the junction box. The PD-C180i/16 DH presence detector ensures you are on the safe side! Installed on a wall or on a window frame, it stops the closing motion of the window drive and prevents people from getting caught by the closing window if they reach into the monitored area. 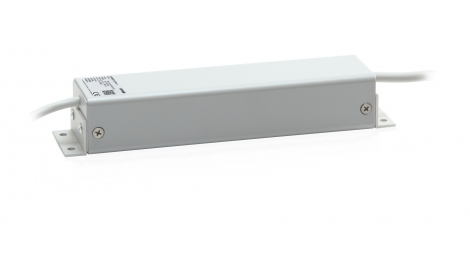 The BL 41 optical signal emitter can visually relay any desired signals in an emergency. It also offers dependable operation in outdoor applications. On the CWSO-RR-S1 acoustic signal emitter in the red housing, you can choose between 32 signal tones that are all approved in accordance with EN 54-3. The classic model: Our FG 42 standard fire bell sounds an alarm using an acoustic signal. The UT 4U fire door operation panel is ideally suited for activation of the BAZ Series fire door control panels.